This collapsible phone grip makes your phone or tablet more functional and colorful. Attach this multitasker directly to your device—and even most non-textured cases. Pop the telescoping design out and hold it for a quick selfie or use it as a stand during video calls. Or mount PopSocket to practically any surface with PopClip—on your car dashboard to see your GPS or your fridge to free up your hands. And it won’t be stuck there either. Both the socket and the clip are easy to stick on and off. To double the utility, use two sockets. Stick them to the back of your device and turn your phone into a horizontal media station, or use them to coil your earphones into place. From understated patterns to vibrant cosmic designs—there’s a myriad of sockets to make your device even more useful. Hi, I'm David Barnett, the founder of PopSockets. I'm honored to have PopSockets featured as today's Grommet. With PopSockets, you can use your phone better -- and have fun while you're at it. Want to know how to have such cutting-edge fun? I'm here to tell you. Hi David! This is something that is amazing and so overlooked. I would not purchase this in store, online makes it easy to find again! My only concern is if they are difficult to un-mount from the phone / case when you want to change the PopSocket or switch a case? When you do get it removed does it leave a mark? Or a sticky spot? @David I have been using this on my phone for about the last six months. I love it! I have also changed cases......a lot. The pop socket comes off easily, and can be put back on another case as if it were brand new. It's amazing. I'm sorry I didn't see your PopSocket earlier. Because of arthritis I attached a leash to my phone case with a permanent adhesive. Your re-positionable gel would be a much better option. Have you considered offering a leash for those who live in fear of dropping their phone? @Dianna Hi Dianna -- we often hear from people with severe arthritis that PopSockets make their lives easier by enabling them to hold their phones effortlessly. We've never considered a leash for extra security, but I'll share your idea with my research and development team next week. Thanks! Hi! This might be the perfect gift I'm trying to find for my group of 100+ convention travelers in November. Can I order ~110 or so with the same, custom text (no special font, no special logo... just need 8 letters to show up)? Thanks! They will be on our Wholesale site soon, Beky. You can get a head start and sign up here. Hi, David. I lovelovelove this idea!! What a great Christmas gift. I want to order 11 of these for my staff...how do I order multiples without having to enter this 11 times!? Hello! 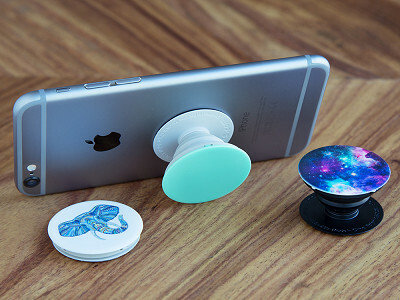 The PopSocket looks like something I need. It looks like it will slip right in my purse too. I'm wondering about how well the PopSocket fits in a pocket. My son keeps his phone in his front pocket much of the time. Will the PopSocket need to be removed pocket carrying people? Love this idea! Would it adhere to a phone case like Otter box? @Guest PopSockets adhere to most Otterbox cases, but they have trouble sticking to some of the older versions that are made of a very soft material like silicone (as almost nothing will stick to silicone). @David I use a mophie. will it work with that? @stephanie Yes that should be fine! Do I need a code to get the free shipping for orders > $25? The shipping charge is still appearing on my order. Thanks. Hi, we are working to get that resolved now. Hang tight! Should be all set. Buy 3 or more and you'll receive free shipping! @Mike Isn't it free shipping for orders over $25? I'm buying 2 sets for a total of $30 and it's still charging me for shipping. Thanks! Hi Gina, it is currently set to 3 or more PopSockets products. If you ordered it prior to that change, send your order # to our Customer Experience team here. @Mike Hi Mike, I didn't place my order yet because I was waiting for you to resolve the issue you spoke of at 11:32. That's when it said anything over $25 was free shipping. I guess that changed. I'll just pay shipping. Our mistake, Gina. Our system wasn't handling the original offer properly so we tried to simplify it. See David's answer above, Clarence. @CLARENCE Hi Clarence - if your Otterbox is the older rubber/silicone version, PopSockets will probably not stick well to it, unfortunately. Not at the moment, Donna. They are an add-on only. What if I don't want to keep the popsocket on my phone while my phone is in my pocket but still want to take the popsocket with me to use at some point? 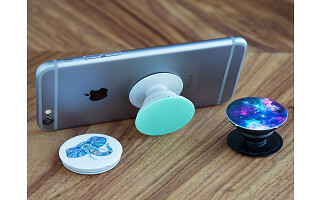 How can I store the popsocket so that the sticky side will not get dirty (assuming I won't have access to water to clean it)? 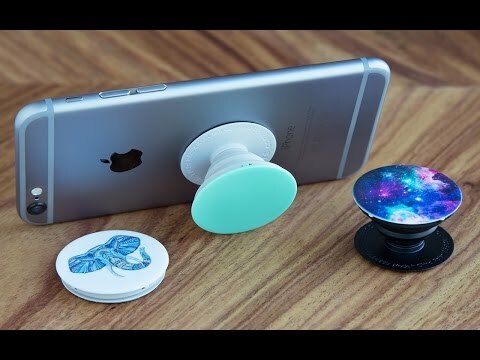 @Roddy Hi Roddy - To preserve the sticking power of the gel when you are not using your PopSocket, you'll need to stick your PopSocket to some flat surface, say, a tabletop or credit card. The gel would otherwise get dirty and possibly dry out permanently. @David That being the case, it would be nice if you included some kind of cap or container for when the popsocket is not in use. @Roddy Interesting idea, Roddy. We could look into offering such a cap for those who want them. The typical users leave their PopSockets on their phones or tablets, as they want to use the PopSockets every time they use their devices. I notice that the pop clip mount has a single-use adhesive. Any plans to use the same type of adhesive as the grip so that is can be move around or removed when not in use. Looks like a great product. @Rick Unfortunately, dashboards tend to be so dirty, and get so hot in the summer, that our re-positionable gel is not a good fit for them. We are working to develop other mechanisms for temporarily attaching the PopClip to dashboards and hope to make progress by the end of this year. @Joel That must be an illusion, Joel, as the PopClip only attaches to flat surfaces, not air vents. We are testing various air-vent mounts, but none is on the market yet. @Joel that photo shows the mount placed on the flat surface between the vents not on the vent itself. If I order more than one of these, do they all have to be the same color? They do not, Glenda. They can be any combination of colors and styles you'd like. Will the device close down to hold the headphones securely? Do you need 2 for this to work? @Jan Hi Jan, that was the original reason I came up with Popsockets -- to have them be a headphone cord wrap. My original plan was that people would use two to wrap the cord around the two, but I've seen some people wrap their cord around just one. This product is great! I have a life proof case for my phone would it stick to it? @Tanya Thanks Tanya! PopSockets have trouble sticking to some waterproof or silicone cases, and cases that are bumpy, but otherwise they should stick just fine! Hello will it stick to a Droid Turbo with ballistic back? @Vanessa My understanding is that the ballistic back is an interwoven nylon, and not a flat surface, so I would not expect PopSockets to stick well to it, unfortunately. Sorry to hear that, Roz. Was it removed frequently or did it lose the stickiness after a short time? Also, did you daughter's friend have a different experience? Thank you for the comment. This kind of feedback is super helpful to Makers. Hi David. I am impressed with PopSocket. It looks like a great product that is innovative & well thought out. I ordered the Tusk version. I would definitely order another one if you eventually add a cool looking wolf version. Do you plan to create more versions? Thanks & good luck with your new product. Thanks so much, Mark. I'll ask David if more versions are on their way. And you better believe I will remind him to make a cool looking wolf version. He's got two customers right out of the gate. Love love love this idea! When you come out with one that attaches to the car vent, I'll be first in line! Thanks for the tip on keeping the plastic cap it comes with to keep the sticky surface clean when not using it! This is exactly the kind of device I'm looking for - the kind that I didn't realize I'd need until I saw it! Question: have you ever given thought to integrating the PopSocket with a TrackR device? I think it would be a great combo. Thanks! I don't know if David has ever thought of it, Victor. But that's a fantastic combo you can put tigether right here on site by adding PopSockets and TrackR to your cart. This collapsible phone grip makes your phone or tablet more functional and colorful. Attach this multitasker directly to your device—and even most non-textured cases. Pop the telescoping design out and hold it for a quick selfie or use it as a stand during video calls. Or mount PopSocket to practically any surface with PopClip—on your car dashboard to see your GPS or your fridge to free up your hands. And it won’t be stuck there either. Both the socket and the clip are easy to stick on and off. To double the utility, use two sockets. Stick them to the back of your device and turn your phone into a horizontal media station, or use them to coil your earphones into place.